President Xi Jinping and other delegation heads arrive for a ‘family photo’ during the Belt and Road Forum at the meeting’s venue on Yanqi Lake on the outskirts of Beijing, May 15, 2017. 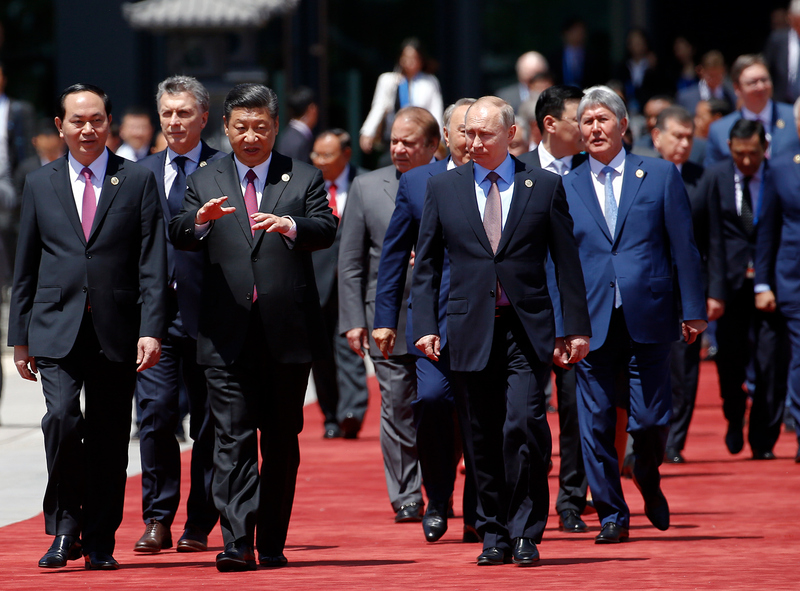 As the second year of Donald Trump’s presidency and sixth of Xi Jinping’s draws to a close, the world seems to be witnessing one of those epochal clashes that can change the contours of global power. Just as conflicts between American President Woodrow Wilson and British Prime Minister Lloyd George produced a failed peace after World War I, competition between Soviet dictator Joseph Stalin and American President Harry Truman sparked the Cold War, and the rivalry between Soviet leader Nikita Khrushchev and President John F. Kennedy brought the world to the brink of nuclear war, so the empowered presidents of the United States and China are now pursuing bold, intensely personal visions of new global orders that could potentially reshape the trajectory of the 21st century—or bring it all down. By the time Xi Jinping became China’s seventh president, a decade of rapid economic growth averaging 11 percent annually and currency reserves surging toward an unprecedented $4 trillion had created the economic potential for a rapid, radical shift in the global balance of power. After just a few months in office, Xi began tapping those vast reserves to launch a bold geopolitical gambit, a genuine challenge to U.S. dominion over Eurasia and the world beyond. Aglow in its status as the world’s sole superpower after “winning” the Cold War, Washington had difficulty at first even grasping such newly developing global realities and was slow to react. On the realpolitik side of that duality, Washington constructed a four-tier apparatus—military, diplomatic, economic, and clandestine—to advance a global dominion of unprecedented wealth and power. This apparatus rested on hundreds of military bases in Europe and Asia that made the U.S. the first power in history to dominate (if not control) the Eurasian continent. Even after the Cold War ended, former national security adviser Zbigniew Brzezinski warned that Washington would remain the world’s preeminent power only as long as it maintained its geopolitical dominion over Eurasia. In the decade before Trump’s election, there were, however, already signs that America’s hegemony was on a downward trajectory as its share of global economic power fell from 50 percent in 1950 to just 15 percent in 2017. Many financial forecasts now project that China will surpass the U.S. as the world’s number one economy by 2030, if not before. In this era of decline, there has emerged from President Trump’s torrent of tweets and off-the-cuff remarks a surprisingly coherent and grim vision of America’s place in the present world order. Instead of reigning confidently over international organizations, multilateral alliances, and a globalized economy, Trump evidently sees America standing alone and beleaguered in an increasingly troubled world—exploited by self-aggrandizing allies, battered by unequal trade terms, threatened by tides of undocumented immigrants, and betrayed by self-serving elites too timid or compromised to defend the nation’s interests. As China has lifted 60 million of its own people out of poverty in just a few years and was committed to its complete eradication by 2020, so he urged a more equitable world order “to bring the benefits of development to countries across the globe.” For its part, China, he assured his listeners, was ready to make “$2 trillion of outbound investment”—much of it for the development of Eurasia and Africa (in ways, of course, that would link that vast region more closely to China). In other words, he sounded like a 21st-century Chinese version of a 20th-century American president, while Donald Trump acted more like Argentina’s former presidente Juan Perón, minus the medals. As if to put another nail in the coffin of American global dominion, the remaining 11 Trans-Pacific trade pact partners, led by Japan and Canada, announced major progress in finalizing that agreement—without the United States. Beijing’s low-cost infrastructure loans for 70 countries from the Baltic to the Pacific are already funding construction of the Mediterranean’s busiest port at Piraeus, Greece, a major nuclear power plant in England, a $6 billion railroad through rugged Laos, and a $46 billion transport corridor across Pakistan. If successful, such infrastructure investments could help knit two dynamic continents, Europe and Asia—home to a full 70 percent of the world’s population and its resources—into a unified market without peer on the planet. If Donald Trump’s vision of world disorder is a sign of the American future and if Beijing’s projected $2 trillion in infrastructure investments, history’s largest by far, succeed in unifying the commerce and transport of Asia, Africa, and Europe, then perhaps the currents of financial power and global leadership will indeed transcend all barriers and flow inexorably toward Beijing, as if by natural law. But if that bold initiative ultimately fails, then for the first time in five centuries the world may face an imperial transition without a clear successor as global hegemon. Moreover, it will do so on a planet where the “new normal” of climate change—the heating of the atmosphere and the oceans, the intensification of flood, drought, and fire, the rising seas that will devastate coastal cities, and the cascading damage to a densely populated world—could mean that the very idea of a global hegemon is fast becoming a thing of the past.